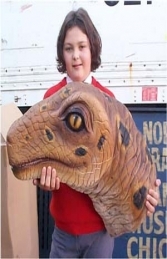 Our small Raptor model dinosaur is highly detailed and ideal to use in a pre-historic group display. Children love these small dinosaur figures. What better models then to attract attention in any pre-historic themed area? This Raptor model looks fantastic in combination with our other small dinosaurs, e.g. the 2ft Triceratops, Stegosaurus and Camasaurus models. This model can be used in any dinosaur or pre-historic themed areas in zoos, museums, play area and theme parks... or if space allowed it would even look fabulous in your children’s playroom, bedroom, garden or woodlands.